Go to WooCommerce > Settings > Products > Deposits. 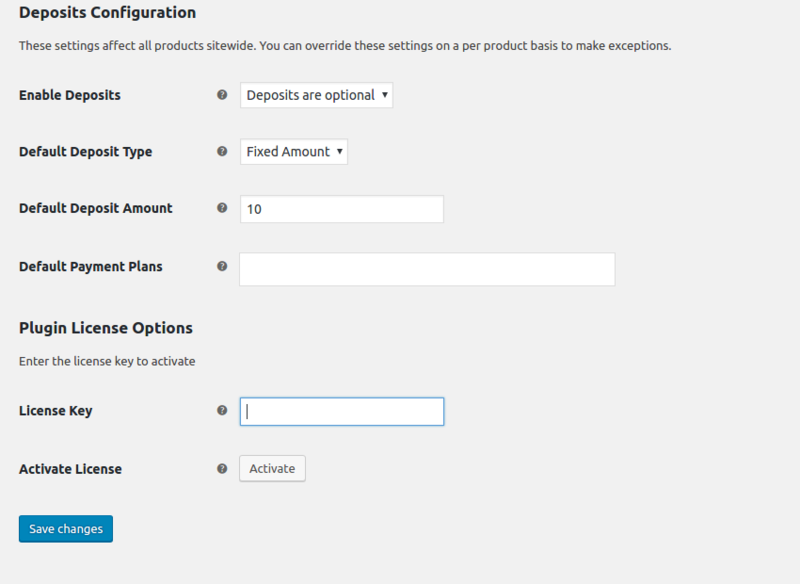 Enable Deposits – Select whether you want to enable deposits on all products. Deposits are optional – Users will have an option to pay the deposit or full amount. Force Deposits – Users will be forced to pay the deposit on the products. Default Deposit Type – Select the default type for the deposits. Fixed Amount – Users will pay a fixed amount of deposit on the products. Percentage -Users will pay a specified percentage of the total price of the product. Payment Plans – Let users select payment plans. Default Deposit Amount – Enter a deposit amount based on the selected deposit type (Fixed or Percentage). Default Payment Plans – Add multiple payment plans to let users select from them. Enter the license key provided to you via email in the “License Key” field. Save Changes and activate the license. Now your plugin will get all updates. This plugin works even if the license key is not active on your website but then you won’t be getting any update notifications, hence it is recommended to activate your license for the plugin.